I was just thinking about that : are you using this for learning the ” out ” too ? Nope, “out” I only train on full jump, first helping with body language a lot and then less&less. Some of the jumps are just “out” and some “outs” can be “out” + “cik/cap”, so it’s important to train cik/caps also in this situation, with a handler on a landing side. Would you use the cik/cap in this case ? 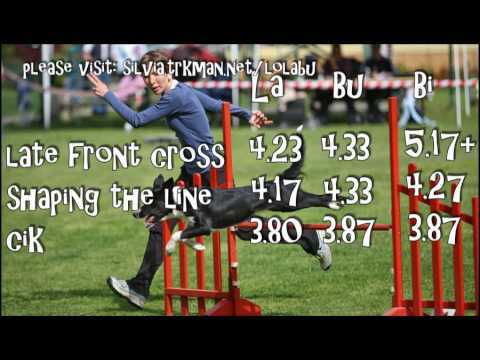 I would use cik for long jumping dogs (Bi), left for normal length jumping dogs (Bu and La) -- and I would use cik with all IF 2 was moved more out (up on your picture). Thank’s ! No, the 2 is right, it’s 90°, I think. Oh, I was just saying in general, if the middle jump of a pinwheel is moved out (making a narrow pinwheel), then it’s definitely cik/cap. If the pinweel is wide, then it’s left/right. And for symmetrical pinwheel, it’s cik/cap for long jumping dogs and left/right for shorter jumping dogs. I have got a nearly 4 year old Labrador x German Shepherd mix dog, and i wondered if cik and cap is still good to teach it to her. Well, we don’t really have a jumping problem but usually, when I want her to jump short i turn myself backwards and say “schhh…”, if you know what I mean. It often works, but I can’t say that I am completely happy with that. I mean, she always jumps full height, so is it still possible to teach her Cik and Cap? Furthermore, it is often really hard for me to get her motivated, is this a problem? Thank you soo much! Sure, it’s always possible to teach an old dog new ticks! 🙂 I started with cik&cap when La was 2 and Lo was 9 🙂 So it’s never too late! But of course, you’ll need to start from zero, with no bars and then build from there. You can still jump full height on your normal trainings and trials, but cik&cap training will need to be done progressively away from that. It might even help with her motivation issues, as it’s so much fun and so much about running! Hi Sylvia -- I just bought your Cik Cap video this week and I am just wondering when you shape both directions at the same time at what point do you give each behaviour it’s name? What do you look for as the desired final behaviour before giving a name (tight around the pole?, offering two turns in the same direction?). How do I make each direction clear but at the same time keeping each directional behaviour strong? Thanks so much. I love the video. Brilliant. Glad you liked the video! 🙂 I start giving a name to it as soon as they are going around it tightly and will just use a name of the direction they choose. I want them to understand it’s about tightness and don’t worry about the direction at all, I just help with the body language and they get it somewhere on a way. J’ai commencé à travailler avec ma chienne selon votre DVD, elle a bien compris le principe, j’en suis à l’étape ou j’ajoute de la hauteur, on en est à la taille médium maintenant (elle saute en Large). Mais de plus en plus, je remarque que quand je lui demande un tourné court, elle me le fait plutôt pas joli, et dès que je demande un “multiwrap”, le 2ème est splendide ! Est-ce que c’est mauvais ? Dois-je revenir une étape en arrière ou uniquement cliquer et lancer ma balle lors du 2ème enroulement ? Yes, 2nd wrap is often easier because there is no speed involved. But of course, you want her to be tight on the first one already, so maybe lower it some again and focus on speedy approaches this time, to make sure she can do it nicely also when coming to the jump with full speed, on a 1st try. Raise it again when you get nice tightness on lower jumps. Est-ce que de cette façon, c’est bon ? Yes, looks good! 🙂 Those with no speed are especially good, so do practice coming in with lots of speed, from a straight line or a tunnel, too! Me??? Greg Derrett? Oh no, where on earth did you get THAT! Do my front crosses really look THAT late?!? 🙂 My handling is WAY closer to Linda’s, just more “aggressive” and is as far from Greg’s as it gets! 🙂 Nobody here uses his system, it’s a no go on our courses where you really want to get to places as fast as possible. And yes, cik&cap goes together with any handling. WOW!!!! I heard you used Gregs!!!!!!!!!!!! My bad!!! HAHAHAHA WOW! Well, thanks for clarifying! I don’t have a trained eye to determine who uses what in the ring.. not yet at least! I’m ordering cik and cap! 😀 Can’t wait! I find reading about the cik-cap jumping interesting and reading about its safety to the dogs more than straight on. Is this a different style than Susan Salo? However she does bend grids as I believe she has a horse background and quite educated in jumping. When can you start cik cap? My pup is 6 months and very fit, reading your lifestyle I believe my pup has a similar one as he goes for many runs and I think is quite agile. However, I am careful to not overdue it. I just want to go slow and be careful. I will take the Foundation class in the fall and he will be a year then so glad about that. Taking Puppy class now. So I guess I should follow that for now and develop him as the class goes before doing too much endurance stuff? Just wondering. I start with cik&cap pretty early, 5 months or so, but of course not as endurance stuff or doing too many repetitions -- just like some fun sprints 🙂 I don’t really know SS stuff, so I can’t comment on that, but I think horses are a bit different as dogs in how they move and jump… You could go to audit March Foundations, plenty of cool discussions there -- and then start some with Cameron. Mastering the whole program takes a bit longer as 4 months, so most people take it twice if they don’t start on their own first already. Hi, I’m having so much fun with the DVD tricks for B, S & C and I’d like to buy another one. I’m certainly gonna order speed & conditioning, that would be great for my agility labrador, but I was not certain about cik & cap. Do you think that a very inflexible dog could benefit from cik & cap more then from shaping a line? Thanks in advance for your answer. Great, happy to hear you’re having fun with the tricks! And yes, cik&cap works with not flexible dogs too, they just find another style -- like throwing hips in one or another direction over the bar, meeting the criteria (landing close with front feet turned in the right direction) without any back bending. Every dog has a bit different style, they all find a way that is the easiest for them based on their build. I have your video and loved it. The truth is, I already started to train Cik & Cap to my dog before I had the video haha, but the video helped me to improve them. Jody turns tight, when I send her to the jump oder when I am in front of her, but there is a more than 180′ turn. But it doens’t work, if I am in Front of her and the angle is not that difficult (wierd huh?). She doesn’t slow down and I guess she tries to overtake me. How can I train that? You mean when you are front crossing on the landing side? -- Not sure why you would be in front otherwise, considering that you’re going in the opposite direction next? Those with front crosses on landing side are hard yes, maybe lower (or angle) the bar some, try to help with a toy and redo (do a multi-wrap) if she is still wide or reward if she collects. So for now, the multi wraps are a very good idea! Thanks alot! You can also make it easier by sending to a tunnel first so that once she is out, you can already be completely static and facing her from the landing side -- it’s much harder if you’re still running in, so you can add that difficulty later. I have been very happy to use your DVD to learn cik and cap to my dog. It is indeed a very powerful tool. However, i have the following problem (that I will try to explain despite my broken english). When my dog run is perpendicular to the fence, everything goes smoothly and my dog, depending cik (tic) or cap (tap), is turning clockwise on the right pole(tic) and anticlockwise on the left pole (tap). I am now trying to get the same result at different angle between my dog run and the fence. From 90° down to 45 °, things are ok. But when the angle further reduce (the dog run is more en more parallel to the fence), it get the following results: let say that the angle of the run of my dog i such that the left pole is the nearest one of the dog. If I say tap, I got the good comportment (anticlockwise rotation around the left pole), but if y say tic, I get a clockwise rotation around the left pole (in fact an “out”) instead of a clockwise rotation on the right pole (that is farther away). So if I understand correctly, you can’t rear cross when coming to the jump from side approach? Can you rear cross when coming to the jump from front approach? For rear crosses on side approaches, help with your body motion more, push more on his line to block him from taking wrong side of the jump and then even more to get him to turn away rather as towards you. If he understands rear crosses well, he will master that as well, just help more with your body to block the wrong side of the jump.